In this study, theologian Charles Wiley explores two important theological terms of Reformed and Presbyterian identity and conviction: "Grace and Gratitude." These two words have important history within our tradition; and they live on in vigorous ways today. Wiley says the terms together are "our gift to the wider church." 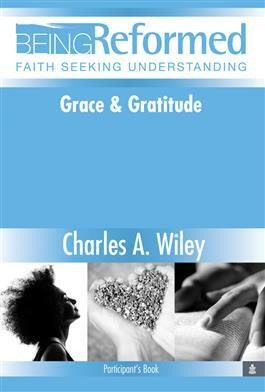 We see the essence of Christian faith captured in the combination, "Grace and Gratitude." This is our witness to God's extravagant love expressed in Jesus Christ—grace; and our response as Christ's disciples, committed thankfully to doing God's work in this world—gratitude. Recognizing the importance of the terms in the phrase and the way they express the rhythms of our Christian lives can be a renewing, revitalizing experience. Seeing ourselves as receivers of grace, daily; and expressing gratitude to God for this grace in Christ by our actions and commitments—brings meaning and significance to all we receive and do. Grace and gratitude energizes us to receive God's love and express that love continually, in worship, work, and service to Jesus Christ. Explore the rich meanings of "Grace and Gratitude" as the story of your Christian life in the church. Let the depth and power of this image shape your identity as a Presbyterian Christian and provide the heartbeat of your faith, every day!